Star wars stormtrooper costume adult fiberglass with helmet - please make offer! Be sure to check the size chart if you view a different item because the sizes will vary. If we make a mistake we want to fix it and we hope you will give us the opportunity to do so. Puerto Rico. Alaska / Hawaii /. Star Wars EFX Incenerator Stormtrooper Helmet. Condition is New. Shipped with USPS Priority Mail. 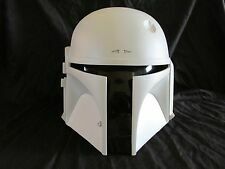 Star Wars Black Series Electronic Voice Changing STORMTROOPER HELMET Used. Condition is Used. Shipped with USPS Priority Mail. 2 -4500 RPM Ball Bearing 50mm Wide by 50mm by Tall by 15mm Thick Blower fans. 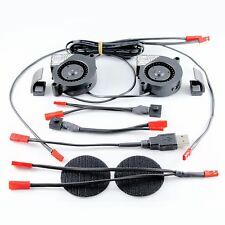 Two fans can run non stop for over 2 hours on a small capacity 2200mAH power bank. and much longer on larger capacity power banks, depending on what you have room for. Visor opening has already been removed. The range finder parts have been included in the kit, but not permanently attached. This will be a great addition to your STAR WARS collection. Pre-cut visor lens smoke color (black). Star wars stormtrooper costume adult fiberglass with helmet. Needs a good home. No time to finish this project. Condition is Used since it has been partially worked, but uncompleted. It needs work to finish. It also has scuffs and should get a fresh paint job to shine again. Everything in the picture is packaged in the box. Please review pics closely before purchase! Please make an offer! Sorry, no returns. Thanks! Otherwise everything else is there and the overall condition is great. Condition is Used. Upf or s al e is a Kylo Ren v oi ce c ha ng in g ma sk. I goti t fo r Halloweenl as t year. W or n it a couple of t im es. Th e qualityi s no t gr ea t on t he voice as t he y ar e notf ro m th e fa ct or y ei th er b ut n ea t nonetheless. Visor (opening) has already been removed.The range finder parts have been included in the kit, but not permanently attached. Great for trooping and cosplay. I will be happy to help. This will be a great addition to your STAR WARS collection. Jedi Knights, Sith Lords, Stormtroopers, X-Wings, Star Destroyers, AT-AT Walkers, droids, Wookiees, Rebel heroes, and more! With a push of a button, your voice changes into that of an Imperial Stormtrooper, the faceless legions of soldiers serving the Galactic Empire who, encased in white armor, are loyal Imperials who undergo rigorous training. 1996, Star Wars. a cool collectible, and hard to find IOB. so if you live closer to Wisconsin, your rate will be less. Use this Voice Changer to change your voice in three different ways! This battery operated voice changer with microphone synthesizes your voice to create a scary monster, an alien or your own amplified sound effects. The Voice Changer features a belt clip and self-locking strip to make for easy and comfortable wearing. The long cord on microphone allows it to be placed inside a mask or on a collar. On/off switch with three settings Requires 3 AA batteries, not included. 1977 20th century-fox film Corp. Mask is in great condition. Original box included. Hasbro Star Wars Darth Vader Voice Changer Electronic Talking Mask Helmet TESTED. Condition is Used. Shipped with USPS Priority Mail. Takara Tomy Star Wars Black Series Voice Changer Kylo Ren Helmet. Condition is New. Shipped with USPS Priority Mail. It is a 1:1 scale that fits all most all heads. Very much like the ones in the movie. These are made to as ordered. I do not produce these in mass quantities and have them ready. NOTICE: The first picture is not what you will receive. Lights up. Condition is New. Star Wars Rubie's Deluxe Imperial TIE FIGHTER PILOT costume mask helmet. New in box Ready to ship Thank you! Hello, up for aucrion is a Hero Stormtrooper Helmet. This is a kit that was cast from an original. Helmet was built and displayed. Please ask any questions. Thanks for looking. 1977 Lucas Film LTD. mask is in great condition. On the sides there may be a few cracks barely visible in less looked up closely. See all pictures for exact item condition. Star Wars original. I do not want to be misleading in any way. Star Wars Kylo Ren Talking Voice Changing Helmet Mask Cosplay Costume. Condition is Used and Works! Visor opening has been removed.The rangefinder parts have been included in the kit but not permanently attached. Range finder stem is cold cast with aluminum powder in the mold. I'm now reinforcing the rangefinder stalk with steel wire to make it more rigid. Up for auction is a Custom 1:1 "Death Watch/Mandalorian/Super Commando" Helmet Prop Star Wars. Helmet is a life size prop and wearable. Originally made by lionsdendc prop maker, this is a ONE OF A KIND helmet and the only one like it in existence. Helmet comes NEW. It has been owned for less than a year and has been on display only that entire time. Helmet features a custom paint design, tinted visor and padded interior. Serious bidders, please ask any questions BEFORE bidding. What you SEE is what you GET. Condition is New. The title photo is color corrected and more representative of the color than that of the other photos that have a more blueish color. Both sets of "ears" are made of foam latex and have a soft, squishy feel. Star Wars Black Series Voice Changer Kylo Ren Helmet. It has been used for display in our podcast studio and remained on a shelf. There isn’t a head strap inside the helmet, no box, but the voice changer does work! Any questions please ask before buying. Great for trooping and cosplay. Visor (opening) has already been removed. I will be happy to help. Poe Dameron Electronic Helmet Star Wars: The Black Series X-Wing Pilot Replica. Prefect for cosplay. Condition is Used. Shipped with USPS Priority Mail. Star Wars The Empire Strikes Back Darth Vader Voice Changer Helmet. Star Wars Movie Roaring Chewbacca Wookiee Sounds Mask, Ages 5 and up (Amazon E..